Lets face it the Great British Weather isn’t always great. Most Gazebos will offer some protection from a light rain shower. But if you want to be certain that rain won’t put a stop to your party or event, you need to look at fully waterproof gazebos. Waterproof Gazebos generally are made of a more water resistant fabric than standard Gazebos or have a second lined layer to stop water penetration. 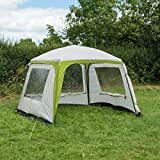 Below you’ll find a range of fully waterpoof gazebos from a wide range of internet retailers to suit all budgets and needs. If you already have a gazebo that you would like to waterpoof, check out our post on waterproofing products. When buying a gazebo for a British ‘all weather’ summer it’s worth considering buying a fully waterproof gazebo. A frequent question we get asked here at Garden Gazebos is whether gazebos are waterproof. In general the answer is no. Most gazebos are designed to proved shade from the sun and not shelter from the rain. If you want a Gazebo to do both then you need a fully waterproof gazebo. The good news is that there are plenty of retailers around that sell waterproof gazebos. The key things is to carefully check the product description when purchasing your gazebo to confirm how weatherproof it is. 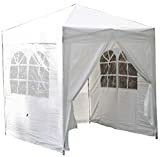 The good news is that some retailers Gazebos are weatherproof as standard and they can often be a similar price to standards gazebos so y0u won’t be out of pocket. 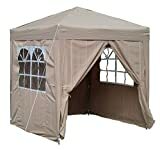 Here’s a few things that you might want to consider when purchasing a waterpoof Gazebo. All ‘weatherproof’ gazebos are not created equal. We’ve seen some Gazebos listed as ‘showerproof’ rather than ‘waterproof’. While these may be able to hold off a few spots of rain, they aren’t going to stand a chance if a summer shower hits. Be sure to read retailers descriptions carefully! To Side or not to Side? 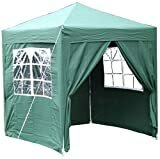 Some Gazebos come with sides which afford protection from sideway rain and light winds. Other Gazebos allow sides to be added as an optional extra. If you are thinking of adding sides at a later date, make sure that these are available for the exact type of gazebo you are buying as gazebos can vary slightly in dimensions. It’s worth considering how many people you might want to fit in your gazebo. If you’ve a big family or are thinking about hosting garden parties then you may want to consider a larger waterproof party gazebo. I already have a Gazebo!? Not a problem! Check out our article here on how to waterproof a gazebo.